An online journal where I can chart my creative path, and share my adventures with my family and friends. Hello! Welcome to the October 2011 MFP New Releases Blog Hop! This month's new releases are: Holly Greetings, Christmas in the Country, Snowball?, Country Thanksgiving, Cardinals in Winter, and Ginger Cookies.For your convenience, all these sets are available TODAY at Mark's Finest Papers. For your chance to win: Comment on the following Design Team members' blogs TODAY before midnight EDT. There will be ONE random winner chosen from the comments on today's Blog Hop blogs. That winner will win Ginger Cookies. We will announce the winner's name on tomorrow's MFP blog post. Mmmmm those cookies look good enough to gobble up Nancy. Great job! Yummy cookies in that jar, NancyRuth! Great cookie jar and it is calorie free. I love the cookies in the jar it is the cutest thing ever. Great job on coloring these yummy treats. Ohhh love that copper paper on this!!! Such a CUTE card! What a great looking jar of cookies!! love it! thanks for sharing! What fabulous framing!! I love the colors!! So cute. I love the bow with your jar of cookies!!!! So cute!! This gingerbread is adorable!!! Oh what fun this set will be! Love the idea of the jar!!! This is fun. First blog hop here. I love gingerbread men. Just looking at all the different blogs has been great. What a CUTE idea!!!! Love the cookie jar! Love the way you gingerbread men are colored. 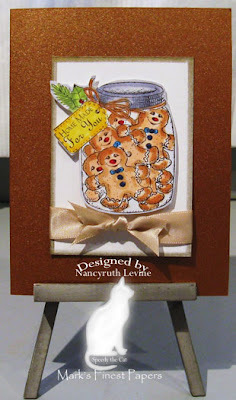 Oh my gosh, those gingerbread cookies in the jar are too cute! Wonderful creativity! Oh my goodness - that is one fantastic cookie jar! Love this card. Cute card. Love the paper. What a cute way to showcase the jar of gingerbread men! Your Gingerbread Cookies look adorable. Great job! Your jar of gingerbread men is so CUTE! Adorable card! I would love to have a jar full of gingerbread men right now! I love Gingerbread Men, even have a poem about them on my Tea in the Garden Blog! Jar of cookies looks yummy and cute! Hi everyone! My Name is Nancy Levine, known as NANCYRUTH on SCS. I have began stamping 20 years ago, though I put everything in the attic for about 10 of those during the hectic years of my single motherhood. I went to a stamping up party about 5 years ago and the stamping flame was rekindled and i have stamped almost every day since then. I work full time in a lighting store and enjoy my career in sales which allows me to fund my crafting habits. 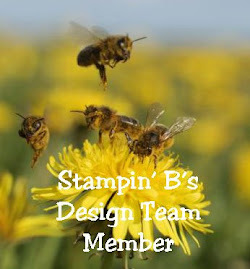 I am also a beader and spend my free time stamping, swimming and making jewelry! I look forward to charting my creative journey through my new blog. Fast forward.... After 13 months of unemployment due to the economic downturn I completed my Therapeutic Recreation certification and now work in a skilled nursing facility creating and implementing recreational programs for the residents. I also had the priviledge of working at Beadz Boutique in Darien Ct. where I fine tuned many of my beading skills!